I’ve written posts before about heading back to school as a single parent, and although I have been trying to avoid doing this, it looks like I may be. I’ve been trying to find a job that pays union, that I am already capable of, or that I already have training for, and I’ve discovered that this job doesn’t seem to exist. 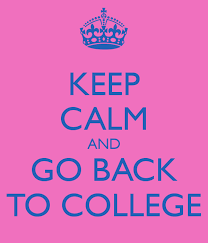 So like the image on below states – Keep calm and go back to college! My education is lacking, being that I went to community college years ago and became a Legal Secretary, aka Legal Administrative Assistant. Yes, this program opened a lot of job opportunities that I would not have gotten without it, yet I’ve discovered the market is flooded with people (women) with this very same schooling. Moms go back to school, all the time! An accountants office recently advertised for a receptionist with some bookkeeping knowledge (I qualify), yet canceled the ad after he was swamped with resumes. At the local Rec Center, I applied for an office position, and I have even worked in an arena/rec center before, and there were two women right behind me applying too. The rec center never called. Short of working at the lumber mill, there is no unskilled, union wage, job around. So I have taken the steps toward a private college, 2 hours away, that offers a government accredited, mostly-online program, entitled Pharmacy Technician. The pay varies, but at this area’s hospitals, the pay is $23 an hour. Very nice. Going back to school as a mom! So now that I have made the decision to go, which took a lot of thinking in the first place, yet I realize that I am jumping ahead of myself. A dozen things could still go wrong. Perhaps they won’t accept me for unknown reasons. Perhaps the class is full. Perhaps I won’t get the two student loans I need. Then it becomes this: there is still 5 weeks of labs to must-do at the college, do I take the kids, or try to get their dad to take them, or leave them home alone? Then, getting through that, there is 2 practicals of 4 weeks each to do, hopefully locally, but what if its not? Then, even worse than all of that, what if I fail? WHAT IF I FAIL? Then I still owe a crap-load of money in student loans and now have a minimum wage job. Let’s face it, I don’t think I am the only one that has sensed a diminished intelligence from being surrounded by children and their politics. Granted there are some very creative moments, but I’m not absorbing a degree in a Rocket Science from peanut butter smears. Here the list of prep to go back and take the program, its do-able. Thinking about nursing, here’s a link with comments from actual back-to-school moms. UPDATE: I did take this program, I studied hard, did two practicums, passed with a 92% final mark, and did get on the casual list at the hospital. Bad news is that the hours were terrible and I ended up going back to school, yet again. explaining periods to boys of single moms, oops, lol….